Be the first to share your favorite memory, photo or story of Kathie. This memorial page is dedicated for family, friends and future generations to celebrate the life of their loved one. Kathie Sue (nee Bachman) Williams, 65, of Camdenton, MO died peacefully at home surrounded by her family on Tuesday, August 28, 2018, after a brief battle with cancer. Kathie served as an elder and Praise Team Choir member at her church, West Lake Christian. Kathie and Mick ran Greenview Auction for many years. 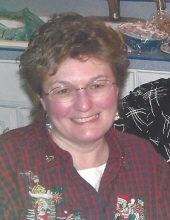 Most recently, Kathie was the finance manager at Happy Trails RV Center in Lebanon. All who knew her will miss her delightful sense of humor and infectious laugh. She enjoyed her flower garden, wind chimes, and anything purple. Kathie leaves to cherish her memory her husband Mick (Michael) Williams, daughters Amanda Williams, Jessica Williams, and grandson Aiden Goodwin. Kathie was preceded in death by her parents Barbara and Orville Bachman. Also surviving are her siblings Ted (Jeanne) Bachman, Fred (Mimi) Bachman, Karen (George) Shearer, and Jim (Ellen) Bachman, her mother-in-law Joyce Williams, her sisters-in-law Sherrie (Ken) Browning and Kris Williams. A memorial service celebrating her life will be held Thursday, August 30, 2018 at 11:30 AM at West Lake Christian Church, 936 Highway O, Laurie, MO 65037 with Pastor Kelly Caldwell officiating. Memorials, in Kathie's name, may be made to the family. To send flowers or a remembrance gift to the family of Kathie Sue Williams, please visit our Tribute Store. "Email Address" would like to share the life celebration of Kathie Sue Williams. Click on the "link" to go to share a favorite memory or leave a condolence message for the family.